I heard of stories where Filipinos going abroad or coming home are pretty keen on packing their bags to the limit... the maximum weight limit that is. They want to stuff everything they can in their luggages and make their trip worth every kilo its worth. 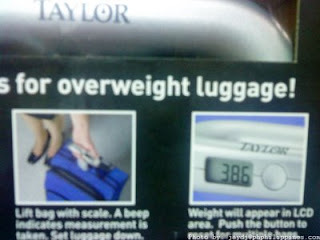 Unfortunately, some Pinoys can't determine just how much weight their boxes and bags are. And they certainly wouldn't want to be subjected to additional charges for going beyond the maximum weight. So they end up reopening and repacking. Doing this in an airport terminal is embarassing, not to mention an eye-sore for on-lookers and passersby. There is the obvious: "Don't overpack !" But if you can't help it, here's a handy tool you can use. 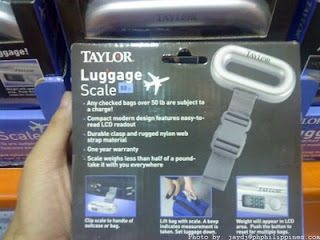 It's a luggage scale. It's in the form of a handle which serves as the scale. You attach it to your bag and lift the handle. A beep indicates that the measure is taken and the weight will appear in the LCD on the handle. This particular model can handle up to 88 pounds of weight. You can easily measure your bags one at a time and find out instantly how much they weigh. You can keep this handy scale inside your bag cause it only weighs half a pound and is small. When in doubt, don't guess. Weigh. hmmm... interesting. where can i get this (both in pinas and sg)?